North American Lake Monsters is Nathan Ballingrud's first collection of fiction, and hopefully the first of many more to come. A good horror story stays with you long after reading it. A great horror story doesn't simply stay with you, it haunts you, and Nathan Ballingrud's fiction does just that. He breathes life into rough, blue-collar characters and places them in some of the best dark fiction being written today. Every single story in this collection is an emotional gut punch. The despair that saturates these tales is rich, and often it is not the supernatural elements in these tales that is horrific. It is hard to choose favorites from the collection, because each story is just as good as the last. You Go Where It Takes You follows a waitress living a stagnant life, when she is presented with the chance for something new. Wild Acre paints a picture of a man struggling with guilt after a fateful night spent at his construction site. Watching him struggle to regain his old sense of self is painful. S.S. sees an angry, white-trash youth, fighting to find his place. The depths to which the boy's depressed mother has sunk are horrific enough, but things only get worse when the lost boy tries to get in with a group of white supremacists. The story is a rough one, although the kid finds a sort of redemption at the end. The Crevasse was co-written with Dale Bailey, and was the first Ballingrud story I read when it appeared in Ellen Datlow's Lovecraft Unbound. Taking place in a Lovecraftian Antarctic, where an underground stairway seems to promise wonders, the story follows a post-war medic on an expedition. One can't help but view this character with pity, as his companions treat him with open disdain. Monsters of Heaven won Ballingrud a Shirley Jackson award, and was the second story I read previous to this collection, where it appeared in Ellen Datlow's Inferno. Another story about a broken man on a downward spiral, this one still managed to twist my insides as much as it did on my previous read. Possibly the strongest story in the collection. Sunbleached first appeared in yet another Datlow anthology, Teeth. For an anthology of vampire fiction targeted towards young adults, Ballingrud has written a story that would make even the hardest horror fiction readers flinch. I was surprised at just how dark this story was, from the vampire itself to the self-imposed alienation of the protagonist. The title story, North American Lake Monsters, is a glimpse into the life of a troubled family. The ex-con spending his first few days free at a cabin with his wife and daughter is swimming against the current in an attempt to make a fit with his family. The man is an emotional roller-coaster, and finds it very difficult to connect with his daughter and bridge the gap that has grown between him and his wife. The lake monster itself serves as a metaphor for the man's many emotions and frustrations, and represents the estrangement from his daughter that is so troubling to him. The Way Station follows a homeless man who is haunted by the past. When Katrina wipes out the New Orleans that he knows he finds himself lost and confused, on a quest to find his long-lost daughter. The tale's surreal moments blend perfectly with the lost soul seeking an anchor in the tumultuous sea his life has become. The collection finishes with an original story, The Good Husband. Another story where horror and domestic problems combine, Ballingrud shows a family struggling with the wife's depression. He explores the age old question of suicide: should the person committing the act be saved, or should they be allowed to take their own life? The husband in the story allows his wife to continue with her fourth attempt, weary of going through the same motions. What follows is a story which slowly grows more and more disturbing and sad, with an ending that is sure to leave a strong impression on readers. This collection is too strong to be missed. 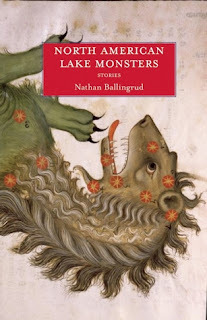 North American Lake Monsters will be published in July, by Small Beer Press, and can be pre-ordered HERE. 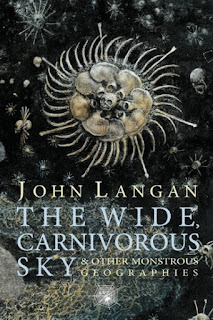 With the release of The Wide, Carnivorous Sky and Other Monstrous Geographies this month, author John Langan now has two collections and one novel under his belt. I recently reviewed The Wide, Carnivorous Sky, and I found it to be an astounding collection of short fiction. 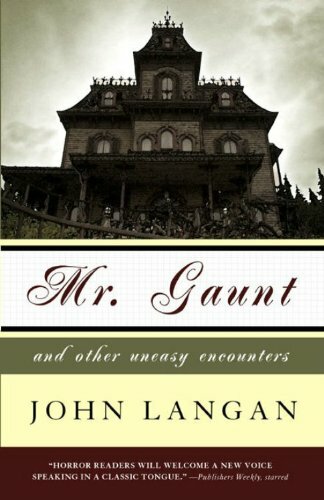 I very much enjoyed his first book of stories, Mr. Gaunt and Other Uneasy Encounters, yet with the new collection it's clear that Mr. Langan just gets better and better. Below is an interview recently conducted with this maestro of horror. AD: It seems that your work continues to grow even more impressive the more you write. Which of your stories do you feel are your biggest accomplishments and/or your favorites? JL: Thank you! It’s funny: with most stories I write, I tend to come very close to hating them by the time I’m done with them. Were it not for the fact that I’ve promised them to one editor or another, I would be happy to put them away, never to see the light of day again. However, once some time has passed and they’ve been published, enough distance sets in for me to view them a bit more dispassionately. (I kid you not, there’s something about seeing them in print, in a different layout than the one in which I wrote them, that helps this process.) At that point, it’s a little easier for me to judge what they do in terms of what my intent for them was. Most of the time, I’m pretty happy with the result. This is not to say that there aren’t word choices I wish I hadn’t made, sentences that couldn’t be smoother, paragraphs that couldn’t have been assembled more elegantly. But I’ve tried to let go of whatever flaws I find in the fiction I’ve published, and move ahead. Especially in more recent years, that’s a process which has been made easier for me by more editors asking me for my work. As far as ranking my stories goes, I’m not sure I’ve accomplished enough to do that. With pretty much every story I’ve written, there’s something I’ve been trying to do in it that I haven’t done before, not in that exact way. Sometimes that’s the ambitious metafiction of a piece like “Technicolor;” other times, it’s the more straightforward creep-out of a story like “Hyphae” (which appeared in Orrin Grey and Sylvia Moreno-Garcia’s fine Fungi anthology). For that reason, I’m pretty fond of all of them. AD: Your work, especially this collection, touches on a variety of horror. In this collection alone there are stories about Poe, vampires, Lovecraft's Mythos and ghouls, werewolves, and zombies. As a reader of the genre, what type of horror works best for you? JL: There’s no type of horror I don’t like, from the subtlest ghost story to the most over-the-top monster fest. What makes the difference for me is the way in which the writer treats the material, a kind of seriousness of intent which is revealed in the various elements that constitute the story. It’s not the same thing as fine writing, or deft characterization, or clever plotting—though all of those things may be present, and more, besides—it’s an underlying commitment to the story at hand as something meaningful—I want to say as the expression of a vision; though not necessarily one that’s been formally set down. Were I a more subtle and articulate critic, I would try to work out the exact mechanism(s) by which the story conveys this sense to the reader. As it is, I’ll offer the example of my good friend Laird Barron’s work. You may not like whatever story or novel of Laird’s it is you’re reading, but there’s no doubt of the absolute integrity of his effort. The same thing might be said of other contemporary horror writers whose work I admire, from Michael Cisco to Sarah Langan to Livia Llewellyn to Paul Tremblay. They believe in what they’re doing. AD: As a writer with two collections and one novel under his belt, as well as numerous pieces of short fiction sprinkled throughout several "best-of" anthologies, it is safe to say you've accomplished quite a bit. Do you have any other authorial goals you would like to meet? JL: There’s a lot I would like to do in the years ahead. I’m working to finish my second novel, whose tentative title is The Fisherman, and I have plans for another five novels in various stages of development. There are something like a dozen stories of differing lengths I’d like to get done sooner rather than later. One of my stories, “How the Day Runs Down,” which I wrote as a kind of closet-drama, was put on in Manhattan by Nicu’s Spoon a couple of years ago, and that left me with the taste to try some more writing for the stage. I’d very much like to reach more readers. I would like to improve as a writer. All of this said, if you had told the eighteen-year-old me—let alone, the fourteen-year-old me who discovered Stephen King’s Christine and was forever changed by it, polarized—that I would do everything I have done up to this point, he would have been wildly excited. I try to remember that. A sense of perspective, while difficult to maintain, is worth holding onto. AD: Any advice for aspiring horror writers? JL: Don’t do it unless you love it. If you love it enough to do it, then do it to the very best of your ability—to beyond the best of your ability. Don’t be complacent. Write about things that are difficult for you to face, about yourself, about others. Don’t be afraid to be ridiculous. Read and re-read what’s come before. Write. Write. Write. AD: What can readers expect from you in the future, both far and near? 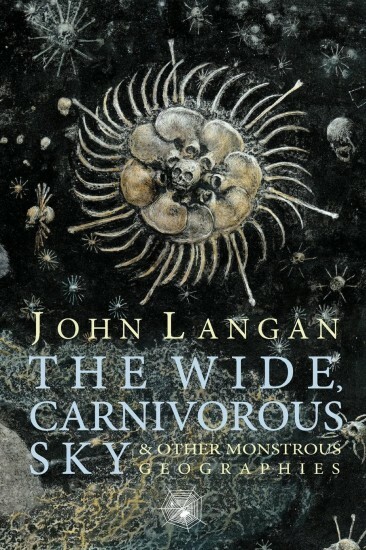 JL: Well, as you know, my second collection, The Wide, Carnivorous Sky and Other Monstrous Geographies, is now available from Hippocampus Press. Recently, I’ve had stories in Simon Strantzas’s Shadows Edge anthology and Eric Guignard’s After Death anthology. I’ll have new stories in Joe Pulver’s Thomas Ligotti tribute anthology, The Grimscribe’s Puppets—out soon, I believe—and Ellen Datlow’s Lovecraft’s Monsters—out in early 2014, I think. I’m planning to have my second novel in to my agent this summer, and to be shopping my third collection of short fiction around in the fall. AD: Mr. Langan, I would like to thank you for taking the time to do this interview. JL: It’s been my pleasure. Thanks for talking with me. The book is mostly told from the viewpoints of three characters. Raybould Marsh is a British spy. He's a tough man, deceptively clever as a man from a simple, poor background. William Beauclerk, brother of a Duke and friend to Marsh, was raised by his drunk, mean, warlock grandfather. Being the younger sibling, William was initiated at a young age into his grandfather's mystical world. The power to traffic with "Eidolons", beings for whom time/space is viewed differently, comes with a blood price. Will's hands are covered with small scars from where he had to cut himself to invoke the Eidolons in a life he had left behind, until Marsh contacts him to join Project Milkweed, a section of the SIS (M16) that is investigating the Nazi supermen. And finally, the third viewpoint belongs to Klaus, one of the Nazi supermen with an ability to phase into a ghostlike state and walk through walls. Klaus makes for one of the more interesting characters, as he finds his allegiance rather torn at times. His sister Gretel has precognitive abilities, but seems quite mad, and causes him no ends of trouble. The book has many interesting concepts. The Nazi supermen were orphans, experimented on and raised by a cold-hearted Nazi doctor and are often referred to as "Dr. Von Westarp's children". Even though they control their powers at will, they can only use them when they are connected to batteries which are on their belt. Wires go from the batteries to the backs of their skulls, making them rather conspicuous. I thought this was all a nice touch, as the batteries limited them and were a source of weakness. The book's most interesting concept though, was it's use of the warlocks. These are not typical sorcerers, and often refer to themselves as "negotiators". By using blood and speaking Enochian, the warlocks summon Eidolons. They then ask for either information, or for the Eidolon to warp reality in some way, then negotiating a blood price. This blood price can be anything from some of the warlock's blood, to a fingertip, or even other people's lives. There's a lot of interesting ideas about the Eidolons, and the more they are used the higher the price. Although the Eidolons can't kill someone themselves, they serve many support roles such as filling the English Channel with a weird, unnatural fog to prevent invasion from the Germans. Overall the book is very enjoyable, and I will definitely be reading the following two books. 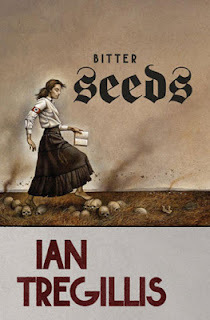 The characters were engaging, the subject matter interesting, and the book was much darker than I thought it would be. The characters are really thrown through some difficult challenges, and oftentimes must break their own moral code to do what must be done or find themselves broken from the things they were forced to do. The end result is a story that is at times exciting, and at times heartbreaking. Recommended for fans of alternate history, weird Nazi science, and espionage. There's a lot to like here, and I can't wait to crack open the second book. Mark Samuels blew me away with The White Hands and Other Weird Tales. I found his first collection, Black Altars to be good but not great, more of a showcase of potential. His third collection, Glyphotech and Other Macabre Processes is another top notch collection in the vein of The White Hands. 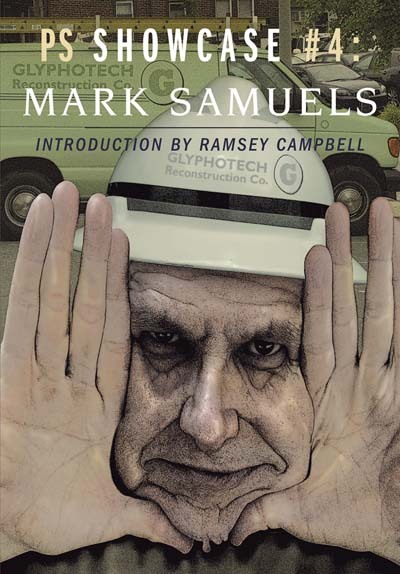 In the introduction, Ramsey Campbell calls Mark Samuels a modern master of urban horror and compares him to the great Thomas Ligotti. Campbell is completely accurate in this description, and Ligotti's influence can be seen throughout the collection. Glyphotech is an interesting collection. Many motifs recur throughout the stories: trains, mannequins/puppets, asylums, madness and paranoia. Samuels excels at writing alienated, awkward characters who manage to find themselves in inescapable situations where surrealism takes over and everything becomes a downward spiral. The collection opens with the title story, Glyphotech, which serves as a prime example of urban, corporate horror. An already estranged man disagrees with his company's new direction, and finds himself the target of a mysterious outside corporation which seems to spread like a disease. Sentinels brings a loner detective into the horrific underground in a story that can't help but bring to mind Clive Barker's Midnight Meat Train. This tale is perhaps the most visceral of all the terrors to be found in this collection, and the implications of the city being involved makes it all the scarier. Patient 704 first appeared in Black Altars, and is the one story from that previous collection that Samuels deemed worthy of saving. The story also has the distinction of being one of my favorite asylum stories. The deterioration of the narrator's mental faculties is handled brilliantly. Shallaballah brings readers into a nightmarish "medical center" in a surreal exploration of possible life after death in a world of urban decay. After reading this story Punch and Judy shall never be seen in the same light again. Samuels visits a mysterious small town in Ghorla, where an irritable scholar seeks out the sister of a deceased and mostly unknown horror author. The weirdness of the story leads to a crazy ending, which is equal parts laughable and disturbing. Cesare Thodol: Lines Written On a Wall has readers visiting yet another asylum, as the narrator unravels the mystery involving a contagious madness that involves mannequins and fungus. A great example of how talented Samuels is at writing original stories in the vein of classic weird horror. Satire and horror combine in The Cannibal Kings of Horror. A horror fan goes to a convention with the hopes to meet his idol, only to receive a wake-up call. The story is over the top, and despite being humorous has a grisly ending. Destination Nihil by Edmund Bertand pretends to be a story by reclusive, abrasive author Edmund Bertrand, a character from The Cannibal Kings of Horror, in which this story in particular is read by the main character. This one is short, and is a story about identity taking place on a bizarre train. The Vanishing Point sees a man at the end of his rope. Samuels evokes hopelessness and slowly turns it into horror as the protagonist's already miserable reality becomes terrifying. Regina vs. Zoskia is a great story about the sane being guilty, as a lawyer is drawn into an absurd case involving an asylum and it's sleepless residents. A Gentleman From Mexico was actually the first story by Samuels I read, in Lockhart's Book of Cthulhu II. The story is another fine example of how Samuels can blend humor and horror equally, and works as a great homage to the Gentleman From Providence. This collection is perfect for any fans of weird horror. It's not as available as The White Hands, as it's run was rather limited, but I would be confident in saying that for fans of The White Hands this book is worth every penny. 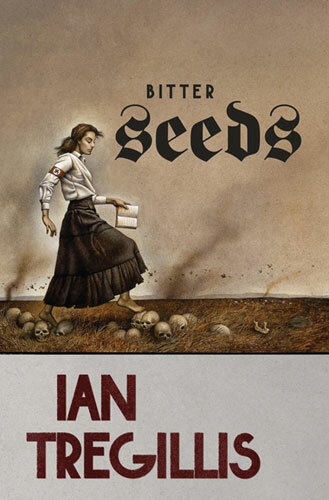 John Langan's name has been in numerous "year's best" horror anthologies, and for good reason. The man can write, and the more he writes the better he gets. Langan's previous collection, Mr. Gaunt and Other Uneasy Encounters, was an astounding set of stories. I've yet to read his novel, House of Windows, although I've heard nothing but good things about it. The Wide, Carnivorous Sky and Other Monstrous Geographies has much to offer horror fans of all kinds. Langan enjoys playing with familiar horror tropes, but in a totally unfamiliar way. He is a stylist, and his stories are all fresh and unique. The collections open with a vignette, Kids, a story from the collection Jack Haringa Must Die! For unfamiliar readers, Jack Haringa is a member of the Board of Advisers for the Shirley Jackson Awards. The collection featured almost thirty short pieces of flash fiction in which Jack Haringa met his untimely doom. Langan's contribution is a short take featuring child zombies. It's really short, and fun, but the weakest of all the stories. How the Day Runs Down serves as a prime example of Langan's stylistic storytelling. This zombie tale reads like a play, and features a stage manager in a mysterious theater talking about the zombie outbreak. The manager's monologues are broken by appearances of other characters, who tell their own personal stories. This story has a good amount of humor, although at times it tugs at the emotions. I first read Technicolor in one of Ellen Datlow's Best Horror of the Year anthologies, although it first appeared in her Poe anthology. This story is a brilliant look at one of Poe's famous tales, The Masque of the Red Death. The narrative once again stands out, as the entire story is told in the voice of a professor as he examines Poe's story and the meaning behind it. The title story, The Wide, Carnivorous Sky, is one of the best vampire tales I've ever read and serves as a perfect example of the way Langan plays with familiar horror tropes. Vampires are typically nocturnal creatures, who spend the daytime sleeping in underground coffins. But Langan's "vampire" instead spends it's days hunting for prey and it's nights resting in a floating "coffin". In the story notes Langan said that as opposed to having his horror in a smaller, claustrophobic setting he wanted to instead embrace the open, and it doing so creates a true "bird (bat) of prey". Add to the mix some army veterans dealing with PTSD and the result is a truly brilliant story. City of the Dog is another story I first read in one of Datlow's best-of anthologies, and another favorite of mine. Drawing from his own personal experiences, Langan takes readers to an early 90's Albany. The narrator is stuck in a most awkward living situation, with a relationship that is falling apart. Things only get worse when the things living under the city get involved. A great story, fans of Lovecraft's ghouls will have a good time with this one. The Shallows first appeared in the anthology Cthulhu's Reign. This book's concept was that all the stories would take place AFTER the stars were right and Cthulhu and the old ones rise. Lovecraftians will know what I'm talking about. The Shallows is a stand out story in that anthology. Langan's approach wasn't as grandiose as some of the others in the book, as he decided to take a look at a rather mundane day in the life of a simple, middle-aged man. The man goes about his daily activities, talking to a crab creature that follows him around like a pet. The bizarre has become commonplace for this fellow, although it's creepy enough for readers. The story's true strength lies in the relationship of the father and his son, and is just as much about what it's like for a father when his son becomes independent. Another excellent story. Langan's approach to the werewolf in The Revel also succeeds as an attempt to break down horror film. Another stylistic approach, the story reads as meta-fiction, and even breaks the fourth wall. One would think it would be difficult to write a piece of fiction that manages to foster terror in the reader while reading like a detached film study, but Langan more than succeeds. Another story I have to mark as a favorite. June, 1987. Hitchhiking. Mr. Norris. is a short story much in the same spirit as the earlier kids. This time the target is horror author Laird Barron, who was subject to a literary "roast" when several authors of the weird posted stories from "The Secret Life of Laird Barron" to their blogs. While several of the stories were strictly humorous, Langan's manages to be quite dark as well. The story's plot deals with the danger of hitchhiking, while evoking darker, more ancient horrors. The collection ends with an original story, which is also my overall favorite, the novella Mother of Stone. The story is penned in the risky second-person, a style of narrative which is hard to make work. This time, however, it does work, creating a slight distance that correlates with the protagonists general detachment. The story itself is a series of interviews conducted with several people in a small town pertaining to a mysterious statue unearthed and put on a display at a local Inn, and the bizarre and fatal incidents that followed. The story has some frightening imagery, and so perfectly evokes dread in the reader. I found myself thoroughly creeped out and disturbed, and I mean that as a compliment. Langan's second collection is, as a whole, astounding. The variety of subject matter paired with his varied stylistic approaches makes for a horror collection that satisfies on many levels. An excellent collection, I highly recommend it to any fan of horror.